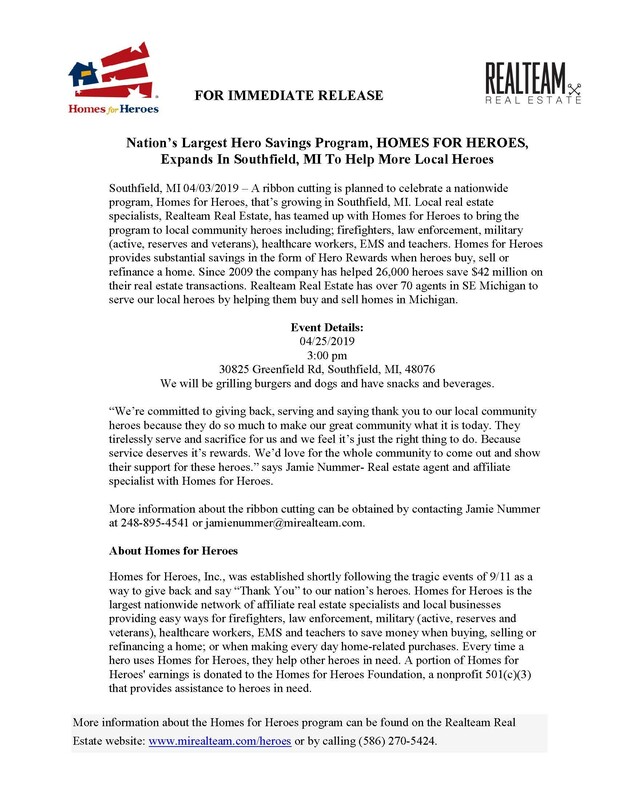 Southfield, MI 04/03/2019 – A ribbon cutting is planned to celebrate a nationwide program, Homes for Heroes, that’s growing in Southfield, MI. Local real estate specialists, Realteam Real Estate, has teamed up with Homes for Heroes to bring the program to local community heroes including; firefighters, law enforcement, military (active, reserves and veterans), healthcare workers, EMS and teachers. Homes for Heroes provides substantial savings in the form of Hero Rewards when heroes buy, sell or refinance a home. Since 2009 the company has helped 26,000 heroes save $42 million on their real estate transactions. 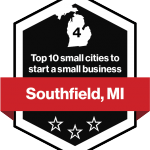 Realteam Real Estate has over 70 agents in SE Michigan to serve our local heroes by helping them buy and sell homes in Michigan. Event Details: 04/25/2019 3:00 pm 30825 Greenfield Rd, Southfield, MI, 48076 We will be grilling burgers and dogs and have snacks and beverages. “We’re committed to giving back, serving and saying thank you to our local community heroes because they do so much to make our great community what it is today. They tirelessly serve and sacrifice for us and we feel it’s just the right thing to do. Because service deserves it’s rewards. We’d love for the whole community to come out and show their support for these heroes.” says Jamie Nummer- Real estate agent and affiliate specialist with Homes for Heroes. More information about the ribbon cutting can be obtained by contacting Jamie Nummer at 248-895-4541 or jamienummer@mirealteam.com. Homes for Heroes, Inc., was established shortly following the tragic events of 9/11 as a way to give back and say “Thank You” to our nation’s heroes. Homes for Heroes is the largest nationwide network of affiliate real estate specialists and local businesses providing easy ways for firefighters, law enforcement, military (active, reserves and veterans), healthcare workers, EMS and teachers to save money when buying, selling or refinancing a home; or when making every day home-related purchases. Every time a hero uses Homes for Heroes, they help other heroes in need. A portion of Homes for Heroes' earnings is donated to the Homes for Heroes Foundation, a nonprofit 501(c)(3) that provides assistance to heroes in need.